MOST cats would benefit from some anti-anxiety medication prior to their veterinary visit. Hissing, shivering, freezing, and refusing to exit the crate are all signs of anxiety. 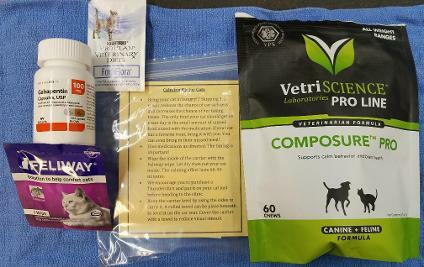 Call 907-747-3788 if you would like to pick up a Calming Kit for Cats to reduce the stress of your cat's visit. The entire kit is $9.50. Feliway Wipe: Feliway is a feline facial pheromone analogue that your cat deposits when she rubs her cheek on your leg or furniture. This substance is a signal that cats use to mark objects in their "territory". You will wipe the inside of your cats kennel with the Feliway wipe and let dry just before transporting. The calming pheromones last several hours. Composure Pro: Provides cognitive and brain function support that can help promote calm behavior without causing drowsiness or unwanted personality changes. One dose has been included. Composure is a natural calming remedy. Feed to your cat the morning of its visit. It should taste like a treat. Medication: The single dose of an appropriate medication should be given 90 minutes before the appointment. Open the capsule and hide it in a small amount of delicious canned food. Be sure to skip one or two meals! This will encourage your cat to take the medication, and later bring treats that your cat loves to the veterinary visit. The medication is very safe and does not interfere with anesthesia. The chosen medication needs to be given two hours before the appointment. Forti Flora: This Probiotic is included to enhance the flavor of your cat's food and help disguise the taste of the medication. See our page on "What You Can Do Before Your Visit." Make sure your cat is hungry, if she does not like treats, bring in her food. Put a Thundershirt on your cat before leaving home. They can be purchased at Pet's Choice. Some dogs would benefit from anxiety medication before visiting the vet. Shaking, growling, not taking treats, hiding, and refusing to walk in the building are all signs of anxiety and fear in a dog. 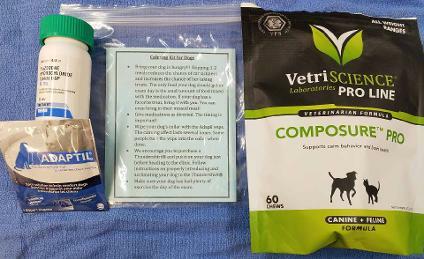 Call 907-747-3788 if you would like to pick up a Calming Kit for your dogs to reduce the stress of his or her visit. The entire kit is $9.50, no matter the size of your dog. Medication: You will receive one dose of pills to be given TWO HOURS before the appointment. Place the pills in a Pill Pocket, hot dog, or cheese. The medication is very safe and does not interfere with anesthesia. It is normal for your dog to be a little sleepy, especially after the appointment. Composure Pro: Provides cognitive and brain function support that can help promote calm behavior without causing drowsiness or unwanted personality changes. Included is one dose of "Composure Pro," a natural calming chew. Adaptil Wipe: Adaptil is a synthetic copy of the natural comforting pheromone released by a mother dog to reassure her puppies. Wipe your dog's collar with the included Adaptil Wipe and then tuck the wipe around your dogs collar. See our page on "What You Can Do Before You Visit." Be sure that your dog is hungry! This is especially important for picky dogs. You are welcome to bring your dog's meal or special treats. Remember, our ability to give your pet treats will significantly reduce your pet's anxiety at the veterinary visit. Place a Thundershirt on your dog before traveling to the appointment. Take your dog for a long hike before giving any of the medication. Every time Maise had an appointment, her owner was unsure whether they would be able to bring her in because she was so terrified! 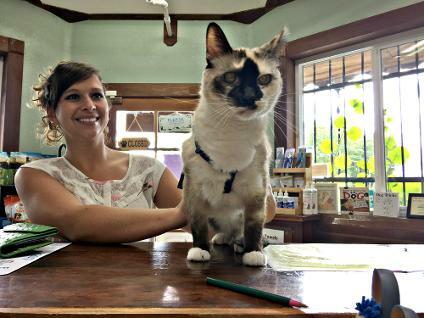 Before her last visit, Maise's owner picked up a Calming Kit for Cats. We also had the iCalm Cat music playing and offered special treats. 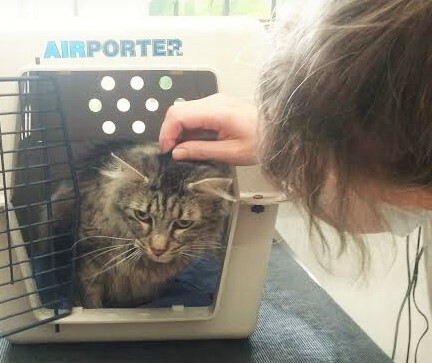 Her owner said she had no problem getting her into the crate and she even let us pet her at the appointment. Maise's visit was minimally stressful for both her and her owner!